Pro Tools - CIS 4372 HCI and Data Viz. 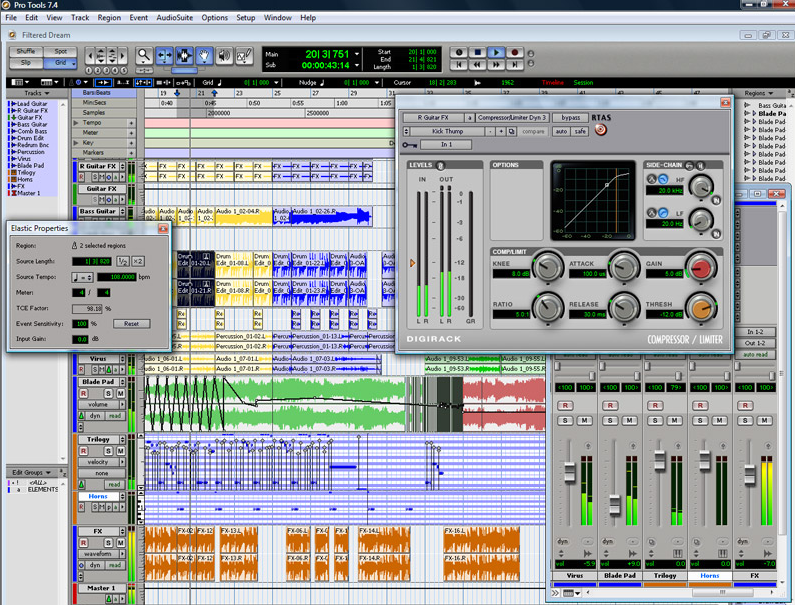 Pro Tools is a multi-track recording program made by Digidesign. Its ease of use has made it the industry standard with professional and amateurs alike. You can do everything from writing and composing with Pro Tools number of built-in plug-ins and sounds, to recording and mixing custom tracks. Pro Tools is as in depth as you want it to be, and there is always something new and exciting to learn. Rule 1 got a 3 because, while the program has a consistent look, there are sometimes way too many windows, which is perceptually and cognitively annoying. Rule 2 got a 4 because of the programs depth if you know how to use it. Rule 3 got a 5 because you get an immediate response from any adjustment you make like changing tuning or applying a filter, which uses the programs lexical level. Rule 4 got a 3 due to there not being positive or negative feedback since no one knows the sound you want except for you. Rule 5 got a 2 because you can easily screw things up if you don’t know what you’re doing, but thankfully everything is easily reversible, hence the 5 rating for rule 6. Rule 7 got a 5 also due to the absolute control of every minute detail this program gives the user, which is immensely satisfying on a cognitive level. Rule 8 received a 2 because the programs massive depth can be a drawback if you can’t remember where what you’re looking for is.